Published: March 11, 2014 at 04:16 p.m. Updated: March 21, 2014 at 07:06 p.m. He believes he's the best receiver in the 2014 NFL Draft, can't wait to compete for best-dressed at Radio City Music Hall, and then go one-on-one against Richard Sherman (and win). If there's one thing about Mike Evans, he doesn't lack for swag. 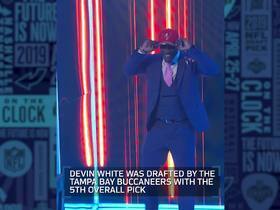 College Football 24/7 caught up with the former Texas A&M wide receiver on Tuesday during his visit to NFL Network and put him on the clock. Was it an easy decision for you to enter the draft and give up your final two seasons of eligibility at Texas A&M? Mike Evans: I made up my mind the last couple games of the season when I felt strongly that Johnny Manziel was going to leave. My No. 1 goal was winning a national championship. Him leaving, man ... If he would have stayed, we could have pursued that championship and the NFL could have waited. We started our (college) careers together so I thought it was only right that we started our NFL careers together. ME: My size. I'm a big receiver who can run and jump and block. I'm probably the best blocking receiver (in the draft). I want to bring my physical mentality to the NFL and match up against physical secondaries. Thing you need to work on most? ME: My route-running. My route-running has improved the last three years at A&M, but I'm looking forward to working with (NFL) vets, running better routes and learning the game more. You've been compared to Vincent Jackson but you prefer a Brandon Marshall comparison. Why is that? ME: He's a big receiver and he's going to block. And he has a swag about him that I like. I just try to model my game after him -- throwing a stiff arm every time he gets the ball, trying to make a defender miss. I try to pattern my game after him. Most analysts like to say that there's Sammy Watkins and then everyone else in this draft. Do you see it that way? ME: Of course not. There are a lot of great receivers in this draft, don't get me wrong, but I'm the best. I really feel strongly about that. Those guys are fun to watch -- Sammy Watkins, Brandin Cooks, (Odell) Beckham, Big Kelvin (Benjamin), but I can do everything they can do. You look at my numbers, watch my film, I feel like I'm the most physical receiver in this draft. I just make the DBs fear me as much as possible. That's what sets me apart, my physicality. You tweeted this during Super Bowl XLVIII: "Denver hurtin my heart right now not even gon lie." What did that mean? ME: Peyton Manning is my favorite NFL player. When I was a kid growing up (in Texas), my mom used to clean the house, and I would just watch Peyton Manning. When you're little, you get hooked. That's why I have a passion for Peyton Manning. The Marvin Harrison connection -- that was one of the best duos in the history of the NFL. You idolize Manning, you hung out with Michael Irvin at the combine and you worked out with James Lofton down in San Diego. Seems like you have an appreciation for old-school. ME: Growing up in Texas, I was a big fan of Michael Irvin's, and just recently I started learning about James Lofton. They revolutionized the game. They started it all. They give us (receivers) someone to look up to. Without them, the game wouldn't be as impactful as it is today. You vs. Richard Sherman ... who wins that battle? ME: I got that question from a lot of teams at the combine -- lots of Richard Sherman questions. "Who wins that matchup? And what would you do if he started talking smack to you." People don't know, but I talk a lot of smack, too. He's one of my favorite defensive players, him and Von Miller. We'll see. But I'm going to pick myself (in that matchup). I look forward to that day. Most common question you received from teams at the combine? ME: They wanted to know what my 40 time was, how fast I thought I was going to run. I ran an unofficial 4.47 and an official 4.53. I think I could get a 4.3 hand-timed if I wanted. I just didn't perform under pressure. But my game speed is different, I don't get caught. I'm a long strider. If you get invited to New York City for the draft, will you accept? ME: Yes. It's been my dream. I don't care where I go (in the draft), I made up my mind that if I got an invite I'm going to go. I heard they have the best-dressed (award). I'm going to try to win that. And I'm going to hug the commish.